Nimo Farah is a poet that creates a new personal mission statement for herself every four years. She recently started calling this experience intentional transformation. Part of her current mission is to develop her storytelling skills as an orator and writer while blending Somali and English together. 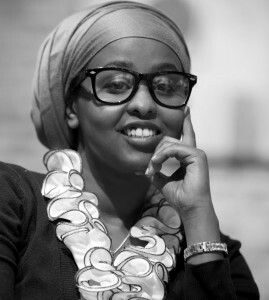 She thinks of herself to be charming and hilarious in the Somali language, often making herself laugh. But unfortunately none of that humor translates into English. She says it’ll be magical when she learns to fuse the two languages together seamlessly. That’s her mission in the current four years. However, it might take a lifetime. She recently began writing and has poems and a short story published on the Water-Stone Review Literary Journal and the Saint Paul Almanac. And as an aspiring storyteller has shared her words at the Black Dog Café reading jam and Equilibrium: Spoken Work at the Loft. She is really excited to be part of the Late Nite Series tradition for a second year. Ryan Dean. Nov. 3, 2012.